St. Isaac’s Cathedral is an outstanding monument of Russian architecture of the 19th century and one of the greatest dome constructions in the world, smaller in size only in comparison with the Cathedral of St. Peter in Rome, St. Paul’s Cathedral in London and Santa Maria del Fiore Cathedral in Florence. 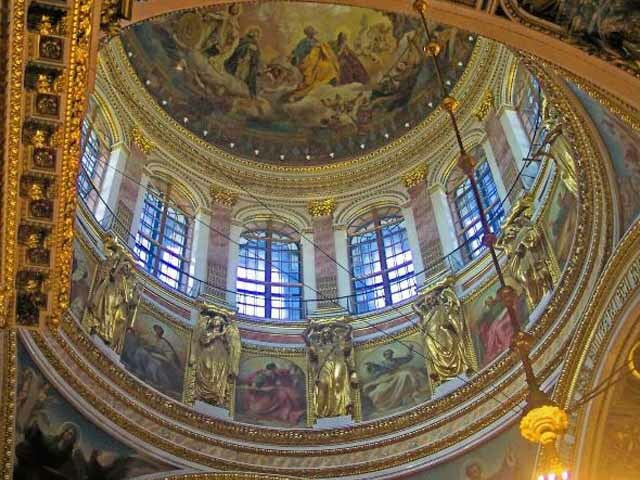 Thursday: 11.00 a.m. - 18.00 p.m.
St. Isaac's Cathedral is the largest, the richest and the most famous cathedral in Russia and the 4th largest domed cathedral in Europe. 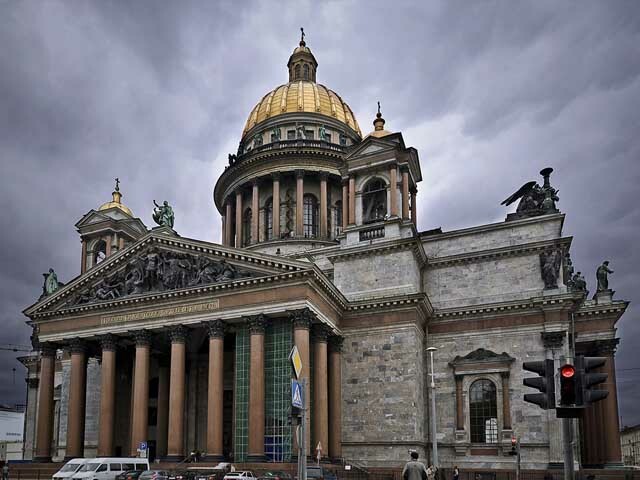 It is also the most "visible" building in St. Petersburg. Its golden dome is so huge that you can clearly see it from the side window of the airplane or from board the ship when you arrive. 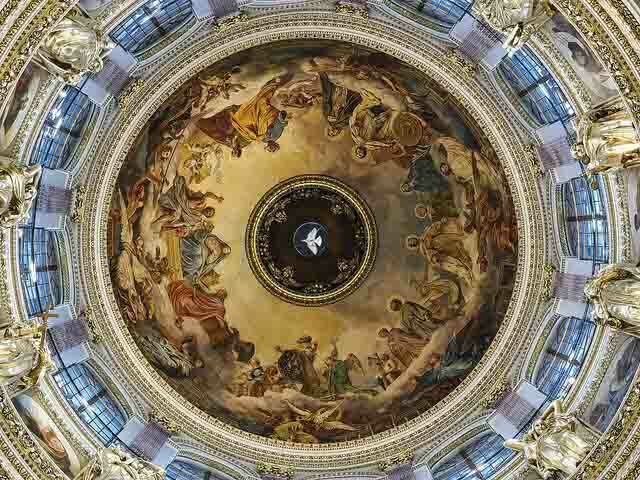 It was constructed in the 19th century as a principal cathedral of St. Petersburg. It is 101.5 meters high and its area is 4 000 square meters - enough to accommodate 12 000 people. The construction took 40 years. 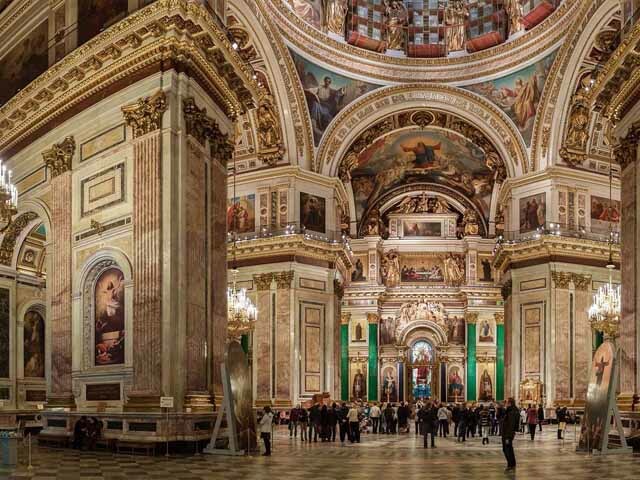 The interior is richly decorated with paintings belonging to the brush of the leading Russian artists, mosaics so intricate that you can hardly tell them from a painting, exquisite combination of semiprecious stones, gilded sculptures and bronze bas-reliefs. 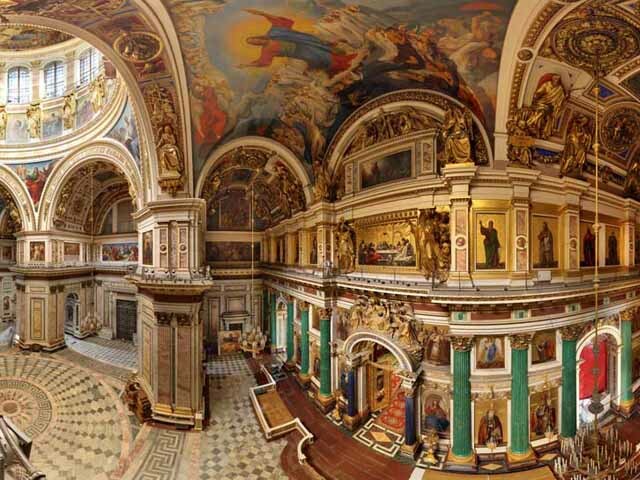 You can find 14 types of coloured Italian marble in the decoration of the interior. The columns of the main icon-stand are made of malachite and lapis-lazuli. Apart from the luxurious decoration the Cathedral is also famous for its unique engineering design. During the guided tour we will tell you how using the engineering techniques of the 18th century the builders managed to strengthen the basement of a building so huge, put up solid granite columns weighing more than a hundred tons, construct a dome which is 25.8 meters in diameter. You will also hear a lot of interesting facts about the history of the construction of the Cathedral, people who took part in it, the historical events the building evidenced and the complicated life the Cathedral has to face today, trying to combine the status of the State important museum and an active church at the same time. 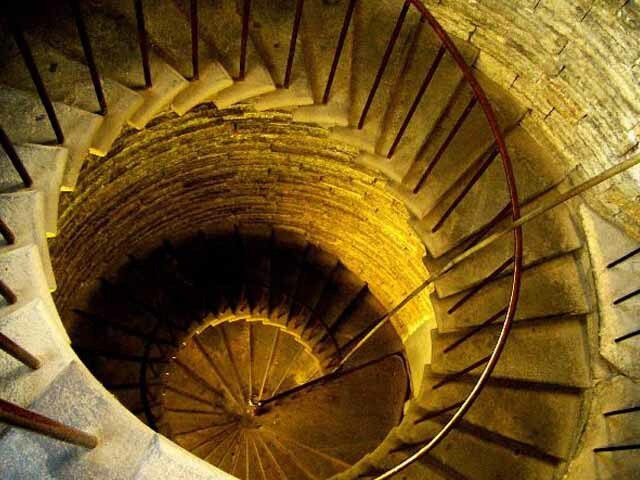 If you are willing to take beautiful pictures and are adventurous enough to afford a climb of 226 steps (no elevator) we can also offer you to go up to the Colonnade of the Cathedral. 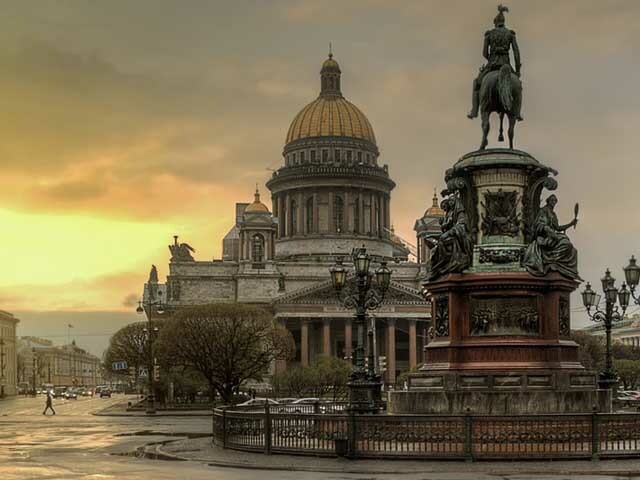 After struggling a breathtaking climb you will be rewarded with a breathtaking view of the city from the height of 43 meters, with the whole panorama of St. Petersburg lying in front of your eyes. Isaakievskaya Square, 4, St Petersburg, Russia.